I just love fruit galettes they are so easy, quick and perfect for company... fresh is best with fruits! In a bowl, lightly stir together the fruit, lemon juice, sugar and flour. Spoon the filling onto the dough, leaving a 2-inch border uncovered around the edge. Fold the edge up and over the filling, forming loose pleats. Bake until the filling is bubbling and the pastry is golden brown, about 25 minutes. Transfer the galette to a wire rack and let cool slightly. Cut into wedges and serve. Makes one 9-inch galette. I love galette! Yours looks so delectable with seasonal fruit. looks fantastic and soooo simple and easy to make! You bet I'm making it soon! What great looking and no doubt great tasting fruit Galettes. Will definitely be trying this recipe out. Great blog. Shame you don't have a 'print this' button. Perfect! I love desserts like this. Easy, uncomplicated, and true flavors. These are gorgeous! I've never made something like this but I would so love to! I am yet to try galette, this one is real tempting. These are great for an al fresco summer meal. Light and delicious. Okay, i had to google galette...consider me its newest fan :) Well done! I adore galettes! They are great for going to the market with an open mind and buying what looks fresh. Yours look mouthwatering!! These are simply beautiful galettes, Claudia! Your versatile talent is simply amazing! I love galettes too and yours looks particularly appealing. You do have a way with food, Claudia. I think I will surprise the family with this tonight - made with berries. I love the ease of a galette and your recipe makes me want to stay in the kitchen today. I really love galettes. Probably because trying to get the pastry dough into a pan and making the edges pretty is just too fussy for me :-) I prefer the rustic beauty and simplicity of a galette with all its uneven edges. Just beautiful, Claudia! Lovely recipe and absolutely beautiful galette! Recipes like this get me so excited for summer. Thanks for sharing. looks simple and delish .. perfect dish Claudia! ^,^ bookmarked it..
such a gorgeous dessert and mouth watering photos! I have never made a galette, but this looks so easy! Oh that looks finger licking good! I love these galettes - they are gorgeous! Yummy! I've never made a galette before but I'm anxious to. Your crust looks super flaky and I can picture me eating it with little flakes all over my plate. There's nothing better than a fruit galette when it's hot out! I would do anything for a piece of the delectable peach one right now! Just gorgeous!!! 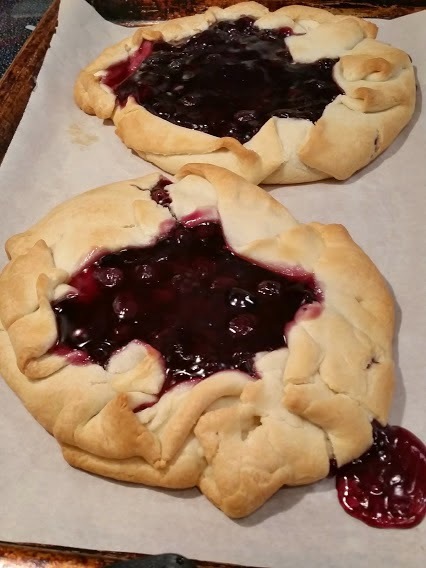 I'm overdue to make a galette...and it's just moved up my list due to your mouth watering post! Thanks, Claudia! Nice recipe! yam.yam....I'll taste it soon. My sisters want so much this!...huahuahua...Kisses from Brazil! Oh! I'm your new follower. If you want, visit my blog and enjoy it! I would have to say even easier then pie! Looks delish, especially that little strawberry one. Claudia, that's so lovely! That first photo is simply pulling me in.